Deprecated function: The each() function is deprecated. This message will be suppressed on further calls in _menu_load_objects() (line 569 of /home/y2r9rgbzqx43/public_html/includes/menu.inc). Deprecated function: Methods with the same name as their class will not be constructors in a future version of PHP; views_display has a deprecated constructor in require_once() (line 3066 of /home/y2r9rgbzqx43/public_html/includes/bootstrap.inc). Deprecated function: Methods with the same name as their class will not be constructors in a future version of PHP; views_many_to_one_helper has a deprecated constructor in require_once() (line 113 of /home/y2r9rgbzqx43/public_html/modules/ctools/ctools.module). We offer Wheelchairs that can be used for personal purposes by physically disabled people and for hospital purposes. These chairs have a rugged MS tubular frame work body that is finished from all sides. Easy to fold, these wheel chairs are compact in size and can be carried from one place to another with ease. A washable rexine seat & back and highly durable aluminum footrests are fitted in these chairs. The wheels of these chairs are fixed with solid rubber tyres, self propelling hoops and hand operated brakes that make the movement easy for the person sitting on it. Two 150mm dia swivel castors are fitted in the in front and pre-treatment and epoxy powder coating is given on these. 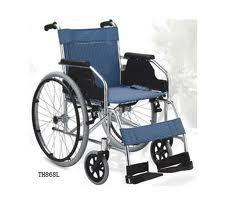 We offer our clients Patient Wheelchairs that need to operated manually by the patients. These chairs have high load withstanding capacity, provide long lasting life and are widely used by some of the leading vendors. We can make these chairs in specific sizes and specifications for our clients. Our customers can avail from us Commode Wheelchair, that comes with a commode seat fitted under. Heavy duty steel is used for manufacturing these wheelchairs. Colored leatherette is used for making the seat & back of these chairs. Hence, these are comfortable and keep the patient at ease. The size of these chairs can be customized for specific purposes. Seat width 46cms & overall width 65cms with commode. We offer foldable wheelchair that can be used for personal purposes by physically disabled people and for clinical requirements. These chairs have a rugged ms tubular frame work body that is finished from all sides. Easy to fold, these wheel chairs are compact in size and can be carried from one place to another with ease. A washable rexine seat & back and highly durable aluminum footrests are fitted in these chairs. The wheels of these chairs are fixed with solid rubber tyres, self propelling hoops and hand operated brakes that make the movement easy for the person sitting on it. Two 150mm dia swivel castors are fitted in the front of the wheel chair. Pre-treatment and epoxy powder coating is given on these. We offer our clients Manual Wheelchairs that need to be operated manually by the patients. 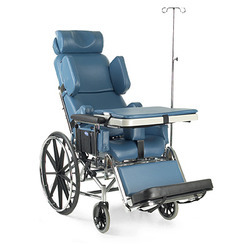 These chairs have high load withstanding capacity, provide long lasting life and are widely used by patients. We can make these chairs in various specifications for our clients. 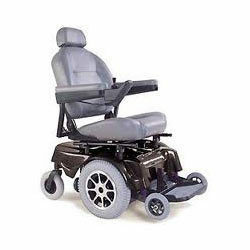 We provide best quality recliner wheel chair for disabled persons. Copyrights © Hi-Tech Equipments Company. | All Rights reserved.